Another windmill-related item in our collection! 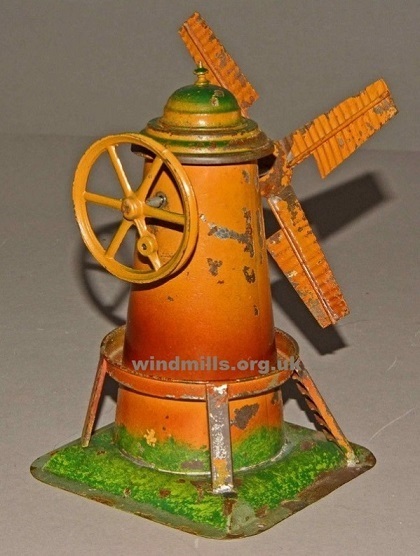 A toy tin-plate windmill made by Ernst Plank of Germany in around 1910. This model is 17cm high. This is a model windmill made by Ernst Plank of Germany in the early 1900s. These models were once popular toys and were designed to be powered by a miniature stationary steam engine such as those made by Mamod, Doll, Bowman, Sel, Meccano, Stuart Turner, Fleischmann and Wilesco. Many full-sized mills, originally wind-powered, were converted to steam engine driven mills at the end of the 19th century. The mill in High Ham is just one example of a windmill, which was converted to steam in the final years of its active life. Come back soon to see a film of this mill being worked by our own working steam engine! This entry was posted in Steam, Uncategorized, Windmills and tagged mill, model windmill, steam windmill on July 16, 2012 by Tower Mill.